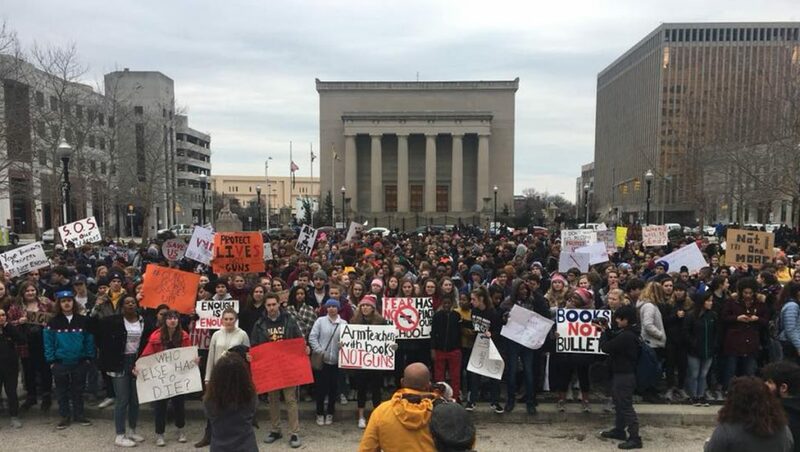 JAISAL NOOR: Hundreds of students from Baltimore City public and private schools walked out of class on Tuesday to demand action on gun control, and to oppose the militarization of classrooms. AMEE ROTHMAN: My name’s Amee Rothman, I’m a Junior at the Friends School of Baltimore, and we’re out here because we’re standing up for our right to safety, and enough is enough. ALANIS BROWN: Protesting for the people that died in Florida and we don’t want them to be a statistic, just like my friend Victorious Swift last year was killed and murdered. I’m starting to protest about him too. JAISAL NOOR: They joined the thousands of students who have spoken out since 17 were killed at Marjory Stoneman Douglas High in Parkland, Florida last month. Many students chanted their opposition to the National Rifle Association for mobilizing opposition to gun control. In response to the Parkland shooting, Donald Trump and the NRA have backed a measure to arm teachers and school aides. AMEE ROTHMAN: Putting more guns into the situation isn’t going to help. JAMAL JONES: Coming off a year with 343 murders, anything that has to do with increased guns, and having all of these issues around guns and policies around guns, is going to be negatively impactful, particularly because people identify gun violence as one of the major sources to all of the murders that occur. I’m feeling energized, it’s nice to see the independent schools and the public schools come together for something for once. I think this is the beginning of a beautiful relationship. JAISAL NOOR: The mayor addressed protestors at City Hall, but many students said they oppose tough-on-crime measures the mayor has proposed, like increasing mandatory minimums. SHANTHAN BENJAMIN-WEBB: As most of us know here, mandatory minimums disproportionately affect black and brown Americans. That’s not okay to be disproportionately affecting another race. I propose that we have stronger background checks and raise the age of possession for weapons. 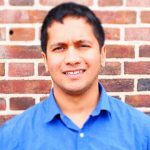 JAISAL NOOR: A national student walkout is planned for next week. For The Real News, this is Jaisal Noor.